Comfortable hotel with good service ... 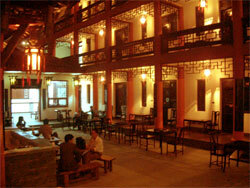 I stayed 3 nights at Wen Jun Mansion on transit to Jiuzhaiguo and Mt Emei. Whether you are a backpacker, budget traveler, or family traveling through Sichuans capital of Chengdu, Wen Jun masion Hotel (located at 12 Qingtai Lu) has everything to meet your needs. This attractive courtyard-style hotel is situated on one of the more tourist-friendly streets in the city, surrounded by buildings in a similar Ming and Qing Dynasty style. The courtyard is a perfect place for tired travelers to relax with a drink and play a borrowed game of mahjong or just chat. Not only is this a comfortable, clean, and affordable hotel, it is one of the most convenient places to stay in Chengdu. 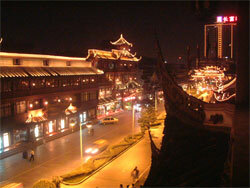 All major tourist attractions are within a short taxi ride that should not cost more than 10RMB. 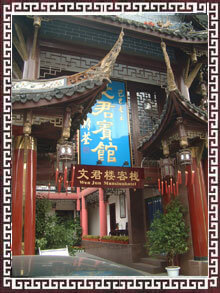 Within walking distance around the corner is one of Chengdus main attractions: Qing Yang Gong (Green Goat Temple). There are quite a few restaurants along the street for the more adventurous diner willing to try Sichuans more common fare. All eateries in the area are reasonably priced, same as the hotel. At the nearest end of the street there is a small grocery store for travelers to buy drinks, snacks, or hygienic products. The staff is very friendly and helpful. Their English skills are better than most in China, but language barriers still exist. They will write down any destination for you to hand to a taxi driver to ensure that you get there. They will also provide personal recommendations as to attractions to see and restaurants in which to dine. There is a tour service provided to destinations throughout Sichuan Province and into Tibet. 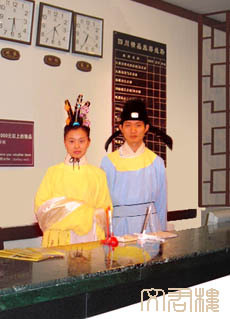 The group tours are all in Chinese, but it is possible to book a private tour in English. For three people to Leshan the cost is 700RMB for a car and driver, 150RMB for a guide, and price for admission to any attractions. Private tours can be book as little as a day in advance and are catered to any needs of the traveling party. Options for rooms include hostel dorms with four or six beds and a deluxe suite. 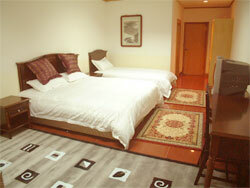 Prices range from 40RMB for a bed to 180RMB for a standard room to 480RMB for the suite. Prices do vary during peak travel seasons and national holidays, at which times rooms are difficult to book on short notice. There is a buffet breakfast offered for 15RMB per person, but it isnt anything exceptional. Cold drinks (water, juice, beer) are offered for prices similar to that of local vendors. Internet access is available, but it is slow and costs 8RMB per hour. Most importantly, airport pick-up and drop-off service must be booked in advance for 70RMB each way. Family room means a big room with one king size bed and a small(child)bed, it's specially for a three pesons family. 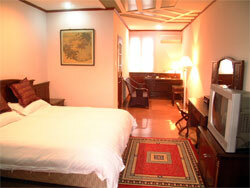 standard2 means a Chinese style or a Western style standard room well furnished with two beds. Deluxe suite, Carpet, a sitting-room, a bed-room, a Dressing room, a big bathroom include the Double Deluxe bathtub with massage and surf. Family Standard Room, Carpet, 1. 8M big size bed, 1M size bed extra, the housing problems of family tourists can be easily solved. Western style standard twin room Standard condition , wood ground, Western style 3 beds room 3 beds for small party. Common standard twin room: Common room and wood ground. Our hotel is just in down town of Chengdu, specially near the Qingyang palace £¬People's park and Dufu's cottage, and only 5 minutes to Tianfu square which is the Chairman Mao's sculpture. And also many Old Tea house around it, such as Tea house in Wenhua park and Baihuatan park which is just in Qintai street. Please contact us if you need more details, all contact details will be on the confirmation email that you will get after you book.